Joy Reid is a farce. She tries to project herself as a “tolerant” liberal yet since her personal website was discovered we’ve learned that she seethes with hatred toward others. Five weeks ago posts displaying her hatred of Gay people were discovered. 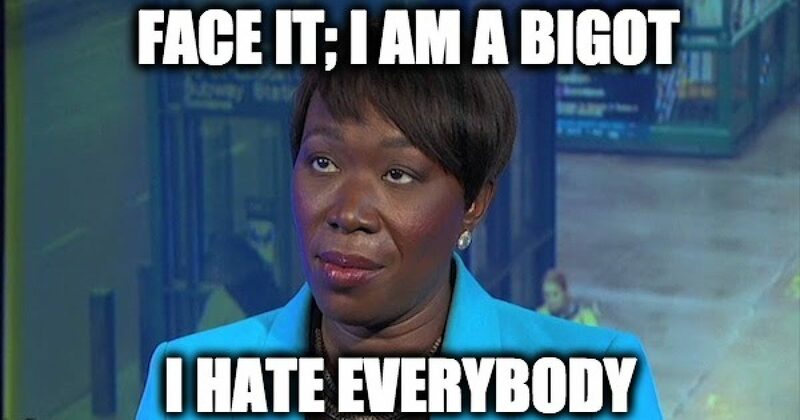 She also photoshopped a picture of Sen. John McCain suggesting he was responsible for the Virginia Tech massacre and was revealed as a 9/11 “truther.” Lost in the story of Rosanne Barr was our revelation that Joy Reid is not a fan of Mexican immigrants, believes the anti-Semitic canard that Jews and Israel control American foreign policy, spewed the modern version of the anti-Semitic blood libel and much more. Because it is essential for the present discussions about Ms. Reid, her bigoted blog posts are presented and expanded upon below, and simliar comments made on her MSNBC program are included. Did you know that the Mexicans who come to the United States don’t really care about freedom? That’s what Ms. Reid believes. That must be why Reid was upset at the POTUS moving the US Embassy to Jerusalem, she was monitoring the development of US policy in Tel Aviv. I wonder if MSNBC’s bigot knows that Mr. Blitzer was responsible for a real Israeli spy, American Jonathan Pollard getting a life sentence for his crime. Three weeks before Pollard’s sentencing, Wolf Blitzer, at the time a Jerusalem Post correspondent, conducted a jail-cell interview with Pollard and penned an article that ran in The Washington Post called, “Pollard: Not A Bumbler, but Israel’s Master Spy.” That article upset both the prosecution and the judge who mentioned it at Pollard’s sentencing. The angry Judge gave Pollard a life sentence which was unusual for the crime and uncommon because of the fact the government had not even asked for one. (…) BTW, loved the insertion of Martin Indyk of all people as an “analyst.” Yeah. No bias there, CNN..
Martin Indyk? Martin Indyk is not a fan of Israel. He has been accused of being downright nasty toward Israel in public and even worse in private. Indyk once gave a sermon at his Washington DC Synagogue on the holiest day on the Jewish calendar, Yom Kippur and standing there on the pulpit in front of the Torah he trashed the Jewish State. Granted these incidents occurred after Joy Reid wrote her posts, but Indyk didn’t just change his stripes when he was put on the payroll of the Hamas funding government of Qatar. Remember he was a close ally of Hillary Clinton who is also anti-Israel. Why would Reid show antagonism toward Martin Indyk who is not friendly toward Israel? The only answer is that Joy Reid’s venom is directed toward Indyk for the same reason she trashed Blitzer–he is Jewish. In another post, Joy Reid agreed with former Iranian President Ahmadinejad’s description of Israel that there is no reason a Jewish State should be in the Holy Land. BTW, Joy, his first name is Mahmoud. Ahmad was his father he was a barber (and the last name is spelled Ahmadinejad, not Amadinejad. Israel’s brutal response to the kidnapping of one of its soldiers by Palestinian militants has touched off what looks for all the world like all out war in the Gaza Strip. The Israeli assault has even included overflying the home of the president of Syria — an interesting non-sequitor. Now, enter Hezbollah from Lebanon. (…) What next, Israelis? How many simultaneous wars are you going to fight? Is the goal to try and topple not only the Hamas government in the Palestinian territories but also the government of Syria? She wrote the above almost precisely a year after Israel left Gaza and didn’t care that Israel was responding to terrorism. Ms. Reid’s issues with Israel continued into her time at MSNBC, for example in a 2014 program she suggested that the US blindly supported Israel and that support for Israel was a racial issue as people of color do not support America’s stance. Blindly supporting? Didn’t she realize that anti-Israel Barack Obama was president? Racial? She needs to examine history because one of the biggest supporters Israel ever had was the Reverend Martin Luther King Jr.
On her program MSNBC program in 2016, she blasted Ted Cruz because he said the government should stop funding colleges that supported the anti-Semitic BDS movement. Her bigoted believe that the purpose of the boycotts, divestment, and sanctions movement (BDS) was to push Israel to make peace which isn’t true. The BDS movement is political warfare used against Israel, intended to isolate it economically, culturally, and politically. The BDS movement bases its attacks on fabricated tales of human rights violations, double standards, comparisons to apartheid South Africa, and false accusations of “war crimes.” Understand, this movement has just one purpose, to delegitimize Israel and to deny the Jewish people their right to self-determination. Both the U.S. State Department and Pope Francis have declared that denying that the Jews have the right to have their own state, is a form of Antisemitism. Perhaps that hatred is behind Ms. Reid’s support of BDS.